By Peter Anderson 13 Comments - The content of this website often contains affiliate links and I may be compensated if you buy through those links (at no cost to you!). Learn more about how we make money. Last edited January 5, 2018 . I haven't written much about fitness on this site as I have another site called Quick To Fit where I write about topics surrounding exercise and getting fit. I'll be honest though, the writing on that site has been somewhat sporadic – as has been my motivation for exercising and getting fit. It's something I've struggled with for some time now, and something I always seem to be working on. With that said, over the past year or so I've been making an effort to exercise more and lose some of the excess weight that I've put on over the last few years. I had some success last year as I lost 30 pounds doing a combination of Weight Watchers and working out with our Xbox Kinect for cardio and some free weights. The problem? I slacked off the last few months of the year and gained 10 pounds back. At least I'm still down 20 pounds from my high weight. This year I've been making another effort at getting fit and losing weight. My goal is to lose 50 pounds this year, and to put on some muscle mass. My ultimate goal is just to be healthier so that I can live longer and so that I can play with my son without getting tired after 5 minutes. I know I can do it. One question that often comes up when talking about working out is where you should exercise. Should you work out at home, or will you be more successful if you do it at the gym? It's hard to say, and the answer may vary depending on the individual. One thing to note though is that quite often people will overestimate how often they will go to the gym, and end up overpaying because of it. One study by researchers at Berkeley found that people often choose monthly memberships at the gym, but end up only going on average 4.8 times a month, much less than many might expect. Because of that their average cost per visit is higher than if they had just opted for what they thought was a pricier per visit pass. members who choose a contract with a flat monthly fee of over $70 attend on average 4.8 times per month. They pay a price per expected visit of more than $17, even though they could pay $10 per visit using a 10—visit pass. On average, these users forgo savings of $700 during their membership. Second, consumers who choose a monthly contract are 18 percent more likely to stay enrolled beyond one year than users committing for a year. This is surprising because monthly members pay higher fees for the option to cancel each month. The point is, most people sign up for the gym expecting to go 3-4 times a week, when the reality is they go only 4-5 times a month. Because of that they're wasting a ton of money – around $700 on average during their membership over cheaper per visit passes. Forgo the membership altogether and you'll be even further ahead. For me I found that to be the case as well. I paid for an expensive membership but only went a few times a month – wasting a ton of money. Instead of continuing down that road I decided to cancel all together and just buy some weights and workout equipment for our home. Instead of spending $70 a month or so on a gym membership I bought all the things I figured we would need (although they were purchased over time, not all at once). Yes, there was a higher initial cost for some of the items, but in the long run we'll still be saving money. So here is the exercise equipment that we bought. 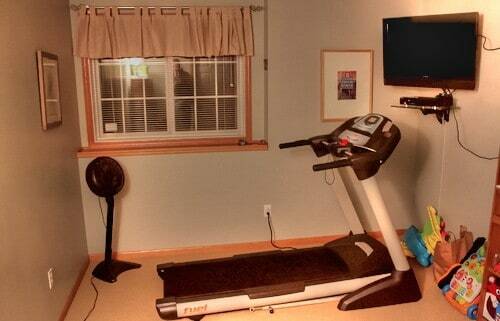 Treadmill: We bought a nice treadmill, similar to the one linked here. At the time it cost about $700, although a comparable one would probably cost more now. A set of dumbbells: We bought a set of dumbbells to do weight training exercises. I bought the dumbbells years ago, but if I could do it again I'd probably buy one of the adjustable dumbbell sets like the one linked. Weight bench: We bought a cheap weight bench to use in conjunction with the weights. Resistance bands: We bought some resistance bands recently to go along with our P90X workouts. Yoga mat: We bought a yoga mat to use for doing floor exercises. Beyond the exercise equipment we've also purchased several exercise programs over the last few years. P90X: We purchased P90X DVD program this year as I had heard about it from other bloggers like Pat Flynn who had great success with the program. I'm currently on week 3 of P90X. Xbox 360 Kinect Fitness Games: We purchased a couple of fitness games for the Xbox Kinect system. Games like Your Shape Fitness Evolved makes working out fun, especially if you're a gamer! DVD Workouts: We've also got a variety of DVD workouts, the on I've used the most is The Biggest Loser Workout, although my wife has a few that are more female oriented. Body for Life: Body for Life is a book that came out a decade ago or so, but it's got an effective plan for losing weight and getting fit – similar to P90X, but in book form. All in all we've probably spent anywhere from $1000-1100 on fitness equipment, programs and gear over the past few years. If we were paying for a gym it would have taken probably about 16 months or so to equal that dollar amount on a $70/month membership. Since we've been using most of the gear for years now I think we've come out ahead. 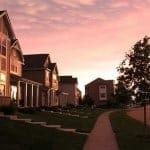 Of course there will still be those who prefer working out at the gym for the classes, better equipment or personal trainers – but for us going the home route has been effective. One important thing to do when you're working out and eating healthy is to keep track of where you are over time. You can do that using a body fat scale, taking measurements and even tracking all your stats in iOS or Android apps. For us we've got a nice body fat scale that helps us to track weight, body fat, muscle mass, total body water and some other stats. Looks like a pretty nice setup. I started P90x again myself and I’m on week 2. I really like the workout, but you only get out of it what you put in. I expect to see 50 lbs less of you in September at FinCon12. That’s what I’m hoping, 50 lbs less by fall! I just did the Yoga today.. Hate that one, I’m not flexible enough! We considered joining the Y, but we knew we wouldn’t get $80/month out of it right now. Wish they offered day passes! We have a stationery bike ($100) and some workout DVDs. When the weather warms up, we like to go for walks or runs along the trail nearby. 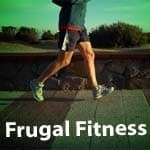 There is a fitness center at a church near me that charges $2/day to go, or $50/YEAR. I want to check it out soon! Our local community center has a gym as well, and if you pay for an annual membership it comes out to about $17/month. That’s pretty affordable too. Course, I don’t really need it now with my home gym! Most people aren’t able to motivate themselves enough to work out on their own, even if they have that DVD program! If you can manage to get yourself going on your, there’s not much need to get a gym membership at all. There are so many bodyweight exercises you can do, and get a great workout without any weights at all! Just picking up a few sets of dumbbells is a good idea too, just to cover all the bases! It looks like your home gym is set! I agree that most people just don’t have the motivation to stick to an extended workout program. As mentioned though most people don’t even really need a membership since there are so many affordable or free options for getting exercise. Tyler was telling me how he told you about WeightTraining.com. You should check it out. It has tons of free workouts, exercises, and a great workout tracker. Shoot me an email (jeff@weighttraining.com), if you would like a personalized walk-through or an Official WeightTraining.com T-shirt. Yeah P90 is so tough. The yoga one is something i should do more too Peter. I’m a single guy with very little bills and fitness has always been a big part of my life so the gym membership is definitely getting its use. I think one day when I have a family, it will be easier to stick with a workout or some type of exercise program if my wife is also a part of it. PS- Jeff, I just checked out that website you gave…Pretty cool! Funny, I just got and put together my weight bench a few days ago. So sore already!! I’m just doing dumbbell exercises right now. I also borrowed 4-Hour Body from the library to see what I can do to accelerate my workouts. Fingers crossed! You definitely don’t have to join a gym, but you DO have to use the equipment to justify its purchase. You can also download free podcast work outs on iTunes. I’m a personal trainer and it is possible to get a good workout at home and have created plenty of them for folks. A few dumbbells and an exercise ball is a must. Remaining consistent and pushing the effort will keep you firm and fit. Consistency is the key. If you are motivated enough than you will remain fit even without membership just by learning some basic exercises at home. But it is indeed difficult to sustain your motivation beyond few weeks. I’m in agreement with Chuck, I’ve worked out from home for a while now and consistency is highly crucial because it is easy to keep telling yourself you’ll do it later. Another big factor that is often over looked is a person’s diet. No matter what a person’s genetics are a well grounded diet is very important in sustaining a firm and fit shape. Previous Post: Find A Better Bank: How To Choose!